Sharky II brings you 3 years of research, 20 patented features, and waterproofing that repels a 3-minute plunge and keeps fishing! KastKing fishing tackle engineering combines efficiency, sensitivity and ways to save you money. A Sharky II spinning reel features 10 + 1 superior grade saltwater approved shielded stainless steel bearings, instant stop anti-reverse, larger contact area triple disc carbon fiber drag system with up to 41.5LBs of smooth drag, upgraded 30% stronger precision mesh brass gears, stainless steel shaft, lighter yet stronger large capacity machined aluminum spool for distance casting, and a reinforced body and rotor – all with waterproof seals to withstand up to 3 minutes of immersion to protect your fishing reel. Sharky II 6000 | Weight 16.52oz/468.5g | Max Drag 41.5LB/19KG | Gear Ratio 4.9:1| Line Capacity 0.405mm/195m,0.435/165,0.47/145 |Mono Capacity 22LB/215Yds ,25/180,30/160KastKing took a great spinning reel and made it more spectacular! The NEW Sharky II spinning fishing reel is lighter, stronger, and is now dunk-proof. Sharky II has a patented design waterproofing seal system that repels a 3-minute plunge and keeps fishing! Kayak anglers and saltwater surf fishing fans will love this spinning reel. You will appreciate Sharky II spinning reels: best-in-class up to 41.5LBs / 19KG of smooth, reliable triple disc carbon fiber drag and 30% stronger precision mesh brass gears for more fishing power. A Sharky II spinning reel is must-have fishing tackle! It gives you everything you could want in a fishing reel – light weight, smoothness, and power. Sharky II spinning reel has a CNC machined aluminum spool that is 10% lighter and stronger with more even line lay, internal grooves for lube retention, and more fishing line capacity. Sharky II has a power launch lip to cast farther. This fishing reel has a unique spool knob sealed with an o-ring system to keep water out of your carbon fiber drag washers for peak performance. 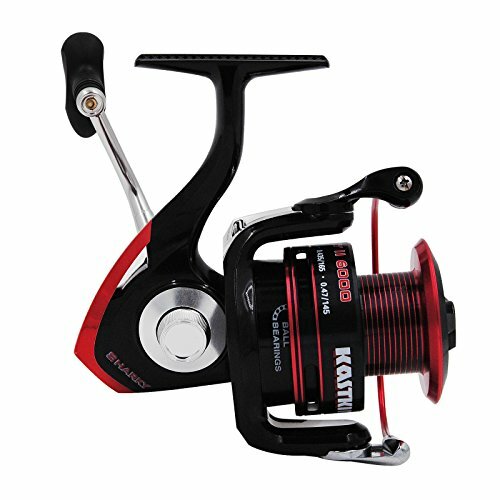 10 + 1 high quality shielded stainless steel ball bearings, 30% stronger precision brass gears, reinforced body, exact fit zero-play handle cogs, and a stainless steel main shaft in the KastKing® Sharky II spinning reel give you smooth, dependable, silent performance. A Sharky II spinning reel on your spinning rod makes a great spinning fishing combo. Although a Sharky II spinning reel has more carbon fiber drag power, more ball bearings, lighter weight, and more line capacity, the best feature of Sharky II is still its low price. Compare a Sharky II spinning reel to a similar size fishing reel that costs more such as from Shimano, Penn, Daiwa, Okuma, Lew’s or other fishing reel brands. KastKing® is an ICAST 2015 award winning brand.